SAN FRANCISCO (Bloomberg) -- When Tesla unveils its Model 3 today, the world will see the more affordable electric sedan that has been part of the company’s “master plan” for a decade. It’s not just a new car. It’s a new vehicle platform, giving Tesla the flexibility to add new bodies with relative ease. The company has said the Model 3 will include a sedan and will also be the basis for a crossover. CEO Elon Musk has also talked about his desire to build a pickup at some point. Sam Jaffe, an analyst at Cairn Energy Research Advisors, predicts in a report for clients on Wednesday that the Model 3 will have a 65 kilowatt-hour battery pack and a range per charge of about 225 miles (362 km). Measured as kilowatt hours per kg or liter, the “energy density” of a battery determines range: The more watt hours, the more miles a vehicle can travel on a charge. High energy density at low cost is the holy grail of the battery industry. Jaffe said he expects the new cells in the Model 3 will have roughly 35 percent more energy than each cell in Tesla’s Model S and Model X.
Jaffe also said car sharing will become a significant part of Tesla’s business model in the coming years, in part because of autonomous driving features such as “summon mode,”which lets the car on its own travel at low speed from a parking spot to it owner. If that ability could be expanded to entire neighborhoods, a fleet vehicle could hover nearby and be sent on demand. In the run-up to the Model 3’s unveiling, little has leaked out about the vehicle’s specifications, styling, range or features. 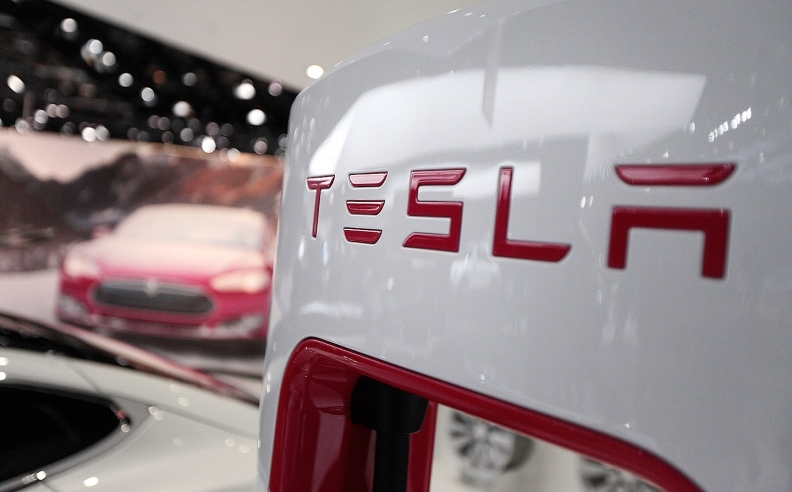 Tesla has said production and deliveries will begin in late 2017; reservations begin worldwide on March 31. Some customers in Australia, Canada, California and elsewhere are camping out at local stores to get better spots in queues, which are set up for each region. Existing owners of the Model S and Model X get priority. In a speech at the University of Nevada at Reno in October, Tesla Chief Technology Officer JB Straubel walked through the company’s product-development history: the Roadster, the Model S, the Model X and, now, the Model 3, which a team has been working on for years.